Last week, we announced the App Center, a new channel to grow canvas, mobile, and web apps that integrate Facebook. We encourage all developers to submit their app detail page this week. Having an app detail page is required for being listed in the App Center, and it will also become the new destination when non-users search for your app. We are already reviewing app detail pages for apps that have high enough quality signals to be listed in the App Center. We are impressed with the quality and number of submissions to date. Checkout the impressive app detail pages created by Zuma Blitz, Soundcloud, and Pulse. 1.) Websites must provide a personalized experience. When people click through from the App Center, they are logging into your website. As a result, do not present these users with “Login with Facebook” buttons. All websites and mobile web apps need to immediately present authenticated users with a logged-in experience. Specifically, we’re looking for personalization, such as name and profile picture, so users know that their Facebook information is being used to create an account. 2.) Review your app settings. 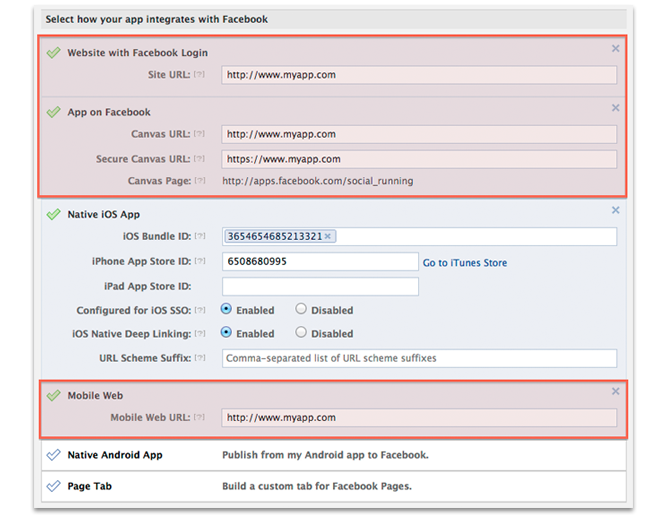 App detail pages are dynamic based on the integrations you’ve specified on the basic settings page of the Developer App. Be sure to review this and remove any old or non-functional integrations. If you don’t use Facebook Login on your website, please don’t list it. For example, if you’re building only an iOS app you shouldn’t have anything in the Site URL, Mobile Web URL or Canvas URL fields. Your images should match the quality of your app. As specified in the guidelines, images shouldn’t have buttons, excessive text, borders, dropshadows, URLs, promotions, pricing, or third-party logos. Icons and promotional banners cannot have a white background, rounded edges or borders. If your logo has rounded corners, please fill the white space in the corners with a color. Also, all promotional banners must include the name of your app. Screenshots should be screenshots of the actual experience (no additional graphics overlaid, no distorted angles). Feel free to use concept art in your cover image and icons, but please keep it out of screenshots. 4.) Input accurate names & thoughtful descriptions. Don’t add any additional keywords to the name of your app. For example, if your app is named “Billiards”, don’t submit your name as “Billiards – Pool”. Proofread your app description for spelling and grammar and remove unnecessary symbols, like stars, hearts and multiple exclamation points. 5.) Don’t forget to save and submit. We understand that it may take some time to create a great app detail page, so we provide the ability to save your work before submitting. Once you’re done, don’t forget to click the “submit” button at the top of the page. In the coming weeks, we will be providing additional information about how the localization and translation process will work for app detail pages. As a reminder, all app detail pages submitted by May 18th will be given prioritized review for the user launch of the App Center. If you haven’t already, create your app detail page today.